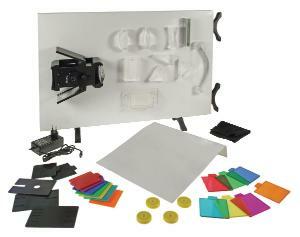 Whiteboard Color Optics are a complete system for investigating color, reflection, and refraction. The set of equipment for ray optics and color experiments uses magnetic-backed components. It can be used on the included whiteboard or any installed steel whiteboard. The whiteboard has a usable surface of 23 x 15.5" and has swiveling feet on two sides, so it can be set up in wide or tall format. The double-ended light box contains a 12V/20W halogen lamp, powered by a wall-mounted AC adapter and cooled by a built-in fan. One end carries a cylindrical lens and slots for mounting the three slit diaphragms for ray optics. The other end carries two adjustable mirrors and an open area for color mixing work. Ordering information: This set includes one 23 x 15½” whiteboard, 1 double-ended light box, 1 convex acrylic lens, 1 concave acrylic lens, 1 semicircular acrylic lens, 1 rectangular acrylic block, 1 acrylic right angle prism, 1 acrylic equilateral prism, one 30°/60°/90° prism, 1 hollow acrylic rectangular cell for water refraction, 1 plane mirror, 1 adjustable concave/convex mirror, 1 matched set of seven color filters, 1 set of seven corresponding colored paddles, one 10 x 10” white card screen, 1 card protractor circle, 4 magnets to hold protractor, 1 experiment manual, and 1 storage box with molded inserts.